book (20 MB) features clear step-by-step instructions and images that will help you master these 25 exciting and dynamic shapes (plus 37 variations!). With the same attention to detail as Helen has demonstrated in her tutorials and magazine projects, the multitude of images helps readers whose first language is not English. Includes a chapter with instructions for 5 simple but dramatic surface techniques that you can apply to your shapes. 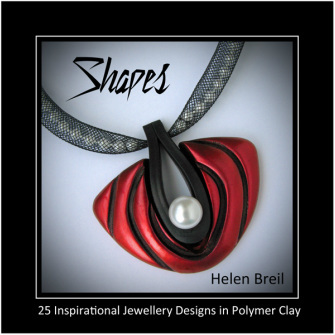 A 46 image gallery featuring the work of 29 renowned Polymer Clay and Metal Clay artists who have brought their unique artistry to the shapes introduced in this book. For intermediate/advanced level metal clay artists looking for unique design ideas, most of the shapes will work for you. 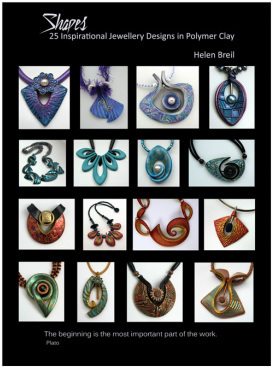 The gallery section shows examples of 6 pieces done in metal clay. Numerous links make it easy to find the project you want to see, and to navigate from project to reference sections. The book can be read using apps such as iBooks, Kindle, and various other apps such as Adobe Reader. Note that document links do not work on the Kindle, but will work on Kindle Fire devices if you download Adobe Reader onto your device. PDF format book is specially formatted for easy reading on your iPad or any other 8" high screen or monitor. Each page has been designed to allow easy reading of the page with no scrolling required. Available as a Download and with an option of getting a printed B&W copy to accompany the electronic colour version.